Brands and companies often see new domain registrations as a brand protection mechanism, securing their brand name in a TLD to prevent others from doing so, and particularly those who may have nefarious intentions. As a result of this, many of these newly bought domains become just an empty shop — lying dormant, lacking any useful content and certainly not adding any value for the domain name Registrant. New TLDs hold a great deal of potential. Apart from being an important defense mechanism for companies, they can really benefit your business if you seize the marketing opportunities that accompany your new domain name. Although it is a company's legal or IP advisors that are typically responsible for monitoring the domain space and advising when a domain registration should be made, getting your marketing and strategy teams involved is important, as it is their vision and creative thinking that can often help a company see potential in a domain name beyond brand protection. Perhaps a new marketing campaign is being planned, a new product line is soon to launch, or an idea for a new website is bubbling up. It is likely only the broader team that will have knowledge of these projects and any domain name needs/opportunities. Broader team involvement is as important pre-domain registration as it is post-domain registration. 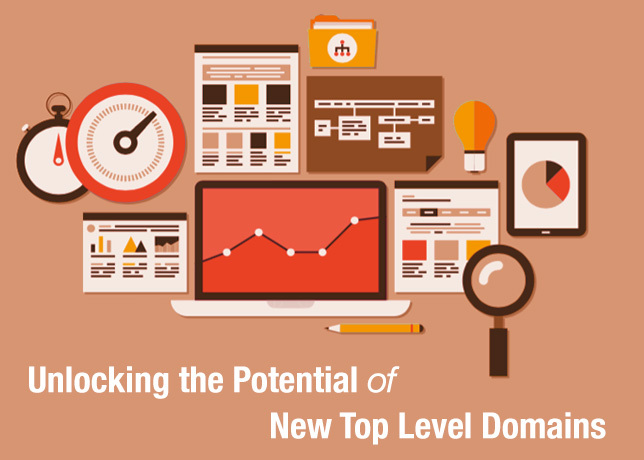 Get ahead of the game and become more discoverable with your domain name of choice. Becoming an early adopter sets you apart from the crowd. Your domain is a way of signposting your business and with the right online marketing tactics, it can help you rise above the noise in search. Learn to leverage your keyword rich domain and increase your conversion rate and improve your cost per acquisition. This is particularly true for those operating in sectors such as finance and tech, where keywords are among the most costly. TLDs can be a great way of refining the messaging around your company's different product lines. The specificity of these new TLDs allows companies to talk directly to customers and highlight specific products, a strategy that financial group IG is actively pursuing with the launch of websites such as IG.Forex, IG.Spreadbetting and Learn.Spreadbetting, while still maintaining its IG.com site. Further, different web properties can speak to different business objectives: client education, acquisition and education. Certain TLDs are 'validated' TLDs and those seeking to purchase a domain name must meet some eligibility requirements. In the case of the .CFD ('Contracts for Difference') and .Spreadbetting TLDs for example, domain holders must be providers holding regulatory permissions (from a financial regulator) for these specialised financial products. As such, this is almost like an exclusive club of trusted providers, and a .CFD or .Spreadbetting website address is an additional badge of trusted authority displaying itself to the external world. Start to make your domain name work for you early on and you can reap the rewards all the quicker! Local Time: Tuesday, April 23, 2019 05:04 AM PDT – Page Load: 0.3250 Sec.